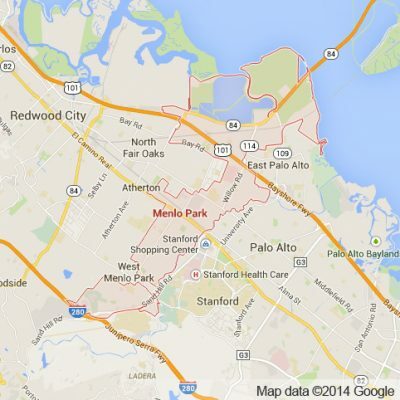 On the eastern edge of San Mateo is the affluent town of Menlo Park. This South Bay enclave is one of Silicon Valley’s must visit destinations. Home to both new and innovative companies as well as important historical landmarks San Mateo represents the perfect interface between the Bay Area of today and yesteryear. National and California Historical Landmarks in Menlo Park include Camp Fremont, Church of the Nativity, the oldest continually operating train station in California, and the Rock Magnetics Laboratory. These are coupled with landmarks of the present such as the Facebook Headquarters, SLAC National Accelerator Laboratory, Geron Corporation and nearby is Stanford University. Menlo Park’s culture of innovation makes it the birthplace of international mega corporations like Google and Round Table Pizza. With Menlo Park at the forefront of progressive innovation and home to a wide range of historical landmarks, this seemingly small Bay Area town is not something to be missed. At Apex Limousine Transportation we are proud to offer residents and visitors of Menlo Park alike an opportunity to experience Menlo Park and beyond in luxury and style. We specialize in comprehensive limo wedding services, junior proms and senior balls , Bay Area airport pick ups and drop offs, and Wine Country tours. For those residents of Menlo Park in the process of planning their wedding we are here to help. We understand the complexity and pressure associated with planning a good wedding. For this reason we take your wedding day seriously and work directly with the wedding planners and couples to ensure our limo services compliment your wedding day dreams. Our professional limo drivers and exquisite fleet of vehicles are able to accommodate a wedding party of any size. For parents who reside in Menlo Park, Apex is consistently their go to choice for junior prom and senior ball limousine service. Our professional limo drivers have an impeccable track record of maintaining the safety of prom and ball attendees as well as providing the environment for a great time. This combination makes students and parents alike rate Apex Limousine Transportation service as their favorite luxury transportation provider in Menlo Park. As a city in Silicon Valley we understand that there is a high demand for airport drop offs and pick ups to and from Menlo Park. Our incredible fleet of sedans, SUVs and Limousines and our professional limo drivers are committed to luxury and timeliness to ensure that you are never left waiting at the airport. For those residents of Menlo Park looking to get away from their week of work there is no better way to spend a Friday night than visiting San Francisco. We take residents of Menlo Park for a night out in the city in complete luxury. Visiting your favorite San Francisco restaurants, bars and other entertainment destinations is a night you will not forget. For those looking for day long trips we also specialize in Napa Valley Winery Tours. These limousine tours are organized between our knowledgeable staff and our guests to ensure you have the Napa Valley experience you want to have. We are excited to offer comprehensive limousine transportation services to the residents and visitors of Menlo Park. There is a reason we are consistently rated a favorite luxury transportation service provider in Menlo Park – join us and you’ll see what everyone is raving about one ride at a time. Please call us for car service all inclusive total for Menlo Park to/from Napa Valley transfer.